After Suzuki partnered VW, Opel will develop the successor to the Agila, shown, alone. 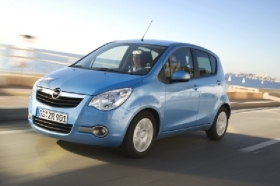 Opel/Vauxhall will build a new Agila small minivan without current partner Suzuki Motor Corp, the carmaker's head of sales and marketing Alain Visser said. “Suzuki has different plans now. We have an existing contract with Suzuki that will expire pretty soon and we will continue to work with Suzuki on the current Agila,” Visser said in an interview at the Geneva auto show. Since Opel rival Volkswagen AG agreed in December to buy a 20 percent stake in Suzuki Motor Corp, there has been speculation that Opel's cooperation with the Japanese automaker for the Agila and its sister model, the Suzuki Splash, would end when the current models are replaced. “We do believe that on top of the three- and five-door Corsa, on top of the (planned) minicar, there is room for a future Agila. And we are now looking how that new Agila can be engineered and developed, giving the new assumptions from Suzuki," Visser said. “We have not dropped the Agila in our future product plan,” he added. Visser gave no further details on the new car or its launch date, but the current Agila model is set to be replaced by 2012 at the latest. Mark Adams, Opel's vice-president for design, said a new Agila would not cannibalize its other offerings in the small car segment. “I think you can see the whole small-car market is growing. It's a significant area of growth within the industry,” Adams said. The current Agila is built at Suzuki's factory in Esztergom, Hungary, alongside its sister model, the Suzuki Splash. Agila sales increased nearly 24 percent to 59,603 units in Europe last year, according to data from JATO Dynamics.